Footwear designers rarely find the direct correlation between their craft and their sport as strong as in soccer. “The boot is the tool you play the game in,” Nathan VanHook, Nike’s soccer design director, tells SI.com. From traction on differing surfaces, performance issues from foot-to-turf and foot-to-ball and even the “adventurous style” that soccer players have pioneered for decades, VanHook sees creating a soccer cleat as a “great blend of performance at the highest level” while the power of design—and its worldwide reach—isn’t lost on the designer who has worked in Nike’s Sportswear and men’s training divisions. Let’s take Nike’s new Anti-Clog Traction technology, debuted along with a litany of other Olympics-related technologies as Nike plans for Rio this summer. With an entire team of Nike Football Footwear folks working on new technology, the goal was to prevent mud from clogging the sole plate of cleats, a two-year project that had them investigating all things materials, science, engineering and chemistry. The new plate will get added to “special versions” of the Tiempo, Magista and Hypervenom models well before the Rio Olympics. With a strong mix of the world’s elite players donning Nike boots, VanHook says finding designs void of distraction allows players to play without wasting time with their gear. To get there, Nike has brought some of its newest technologies to its soccer line in recent years, form the Flywire cables, the Flyknit cuff and lunarlon cushioning (in street performance). That’s why Nike’s latest cleat—the new Mercurial, unveiled as part of Nike’s focus on the Rio Olympics—puts a premium on speed and minimizing distractions. A new anatomical sole plate uses a foot contour map to eliminate the gap that previously existed underfoot, cradling the foot and reducing pressure-point irritations and unwanted movement inside the shoe. A new vacuum-forming process for creating the plate allowed Nike to hollow it out and make it 40% lighter than the carbon fiber plate it replaces. Along with the new plate came testing on stud shapes, resulting in a mix of studs that act like claws when accelerating but have the surface needed to help with braking. 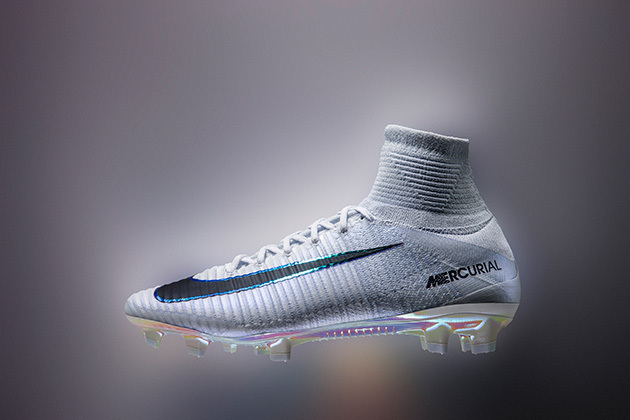 For the Mercurial’s new upper, Nike adapted Flyknit with a 3D texture. The raised surface—with a base thickness of 1 millimeter, increasing to 2.5 millimeters in the forefoot—was designed to create friction between the cleat and the ball. As VanHook looks to the future of soccer, with its speed and constantly unified movements on the field, his design touches have a link to everything he’s once designed. “Anything you’ve done in the past, your previous work, it takes you back to a good time and what you learned and what you didn’t learn,” he says. Whether mud, Rio, speed or the next World Cup, VanHook must put his focus on the pitch and the connection between the player's foot and the game. Tim Newcomb covers sports aesthetics—stadiums, sneakers, uniforms and more—for Sports Illustrated. Follow him on Twitter at @tdnewcomb.